Much has changed since the height of the refugee crisis that gripped Europe in the summer of 2015. Since the shocking images of drowned Syrian toddler Alan Kurdi went viral, the crisis has largely been out of international headlines. But it doesn’t show any signs of stopping. Since 2015, Europe has scrambled to cope with the arrival of around 1.5 million people by sea. In an effort to stem this flow, many European countries have tightened their policies and borders. In 2016, the European Union forged a controversial “one in, one out” deal with Turkey to stop the tide of migrants and refugees fleeing to the continent from the Middle East. 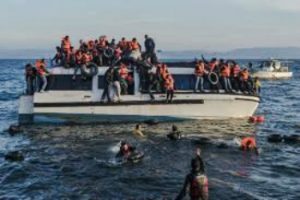 And, this year, Italy has adopted an aggressive approach to halting migration across the Mediterranean from North Africa, backing the Libyan coast guard’s rescue efforts and cracking down on nongovernmental organizations (NGOs) operating off the country’s coast. The influx of migrants not only from war-torn Middle Eastern countries but those from many impoverished African nations have also been posing a big burden on Europe that can’t possibly accept and support all these migrants into their countries. Despite the stringent guarding of international waters by various agencies both public and private, many still manage to avoid authorities and sneak into Europe without anybody knowing and that’s really the bottom line of all these migration issues now. No country can reasonably absorb 97,500 unauthorised migrants in six months. That is what Italy is trying to do as mainly economic migrants from Africa take advantage of the lack of effective government in Libya to sail across the Mediterranean to Europe. With no let-up in the flow and another 700,000 would-be economic migrants waiting in Libya to pay people-smugglers for a passage, Europe is still failing abysmally to protect its borders. Italian Interior Minister Marco Minniti says his country is “pushed to the limits of its tolerance”. A possible candidate for prime minister, Luigi Di Maio of the fast-growing, anti-migrant Five Star Movement, talks of “a pressure cooker that could explode”. al-Sarraj, warned of would-be terrorists heading toEurope. Due to their close geographical location to many other nations in distress right now, refugees can always be seen asking for asylum in many European countries. It is all over the news, so it should not come as a surprise. Unfortunately, it has put the lives of many Europeans at risk of terrorism and we have seen it time again. One of the most recent attacks happened in Barcelona and the string of attacks as well in the UK just this year alone has left the entire continent on heightened alert because many innocent lives have been lost, which is why it is quite understandable if they are tightening their migration policies to prevent terrorists from gaining access to their countries in the first place.